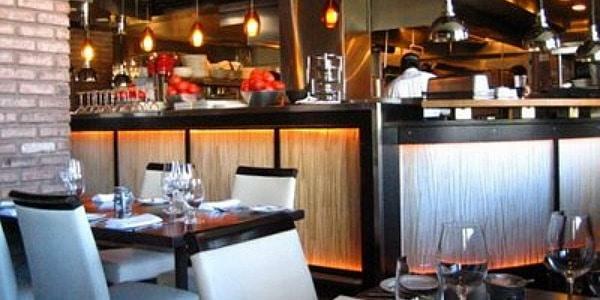 Prime 112, located in Miami Beach on Ocean Drive, serves top of the line steaks and Italian food. The restaurant is housed where the former Brown’s Hotel was. This hotel was built in 1915 and was the first Miami Beach hotel. It seems perfect that it is now the location of this excellent restaurant. Near the restaurant is the Prime Bar and Lounge. The Prime Hotel is a hot spot for celebrities and one can definitely enjoy the restaurant when staying at the hotel. Right when you enter, you’ll notice the bar and the interesting snack they serve there: strips of bacon! This is a bold concept, but the rest of the restaurant will impress you just as much. The iceberg wedge works great as a starter and can serve four people. It has lots of apple bacon and bleu cheese to suit your tastes. Whatever steak you order, make sure to include the truffle butter! It’s delicious and a specialty at Prime. Be careful your eyes aren’t bigger than your stomach because even some of their smaller portions are sure to fill you up with the richness of the perfect cuts they serve. Although the restaurant is known for it’s superb steaks, the Kobe burger is a huge hit. This delicious burger will be cooked to your specifications, no mistakes here! You can also try this as sliders, but the delicious flavors are suited better for a larger burger. Try the delicious sides, especially their mac and cheese and sweet potato. Going with more people will make it easier to taste many of their delicious sides. For dessert, Prime offers the radical choice of fried oreos and ice cream! While it sounds much like carnival fare, this restaurant serves it to the top standards, just like everything else they prepare. The owner, Myles Chefetz, owns the Myles Restaurant Group which also includes: Prime Italian, Nemo, Shoji Sushi, Big Pink, and Prime Hotel & Lounge.